"This girl has the most angelic face I ever saw. I've got to make a test of her right away." 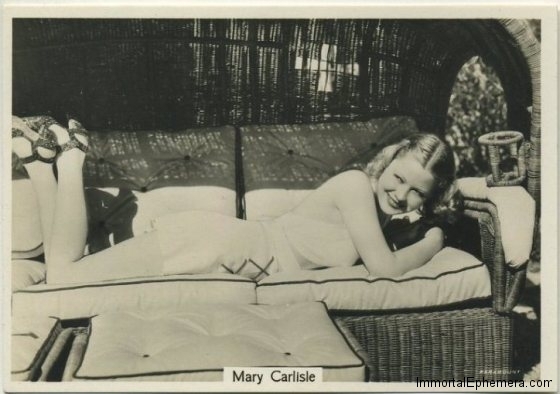 -- Attributed to Carl Laemmle, Jr.
Born in Boston, Massachussets, February 3, 1914, beautiful Mary Carlisle, who appeared in the bulk of her sixty-plus films during the 1930s, turns 100 years old today! Best remembered today as a Wampas Baby Star of 1932, a class that also included stars such as Patricia Ellis, Gloria Stuart and Ginger Rogers, and for appearing in three Bing Crosby films: College Humor (1933), Double or Nothing (1937) and Dr. Rhythm (1938), the petite Carlisle retired from films after appearing in the PRC low budget horror film Dead Men Walk (1943) starring George Zucco. On March 14, 1942 Carlisle married James Blakely and was gone from movies soon after. The couple had been connected by the press as an item since Blakely's arrival from England for Hollywood in 1934. 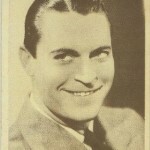 Blakely had acted in over a dozen movies himself during the '30s, though by the time of his marriage to Carlisle he was referred to as a British-born aviator in most reports. It was World War II after all. Blakely resumed his Hollywood career as a 20th Century-Fox executive in the 1960s. Carlisle widowed him in 2007. 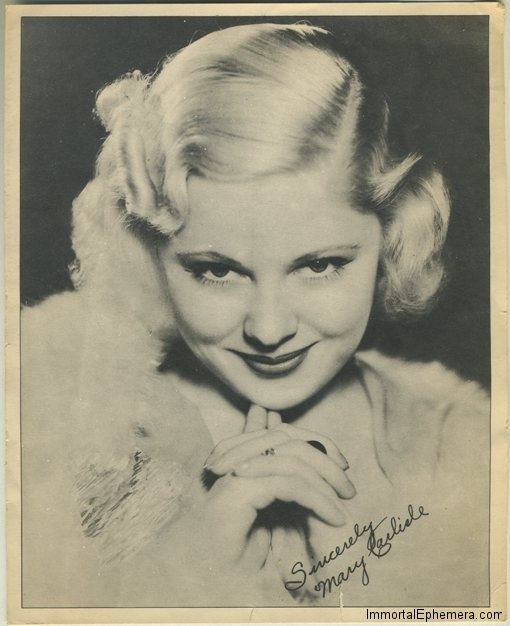 After their marriage and the birth of son, James, Jr., Mary Carlisle busied herself in a new career for the Elizabeth Arden Salon in Beverly Hills. A 1958 news clipping reported her to be one of the "most efficient and charming salon hostesses." Newspaper articles still have her affiliated with the Salon as late as 1972. 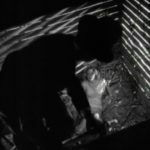 Besides her Crosby efforts and the public domain PRC film you may have seen the petite ingenue with Wheeler in Woolsey in Kentucky Kernels (1934), with Jimmy Durante and Lupe Velez in Palooka (1934) or as Lionel Barrymore and Alice Brady's daughter in Should Ladies Behave (1933). She's Barrymore's daughter again the following year in This Side of Heaven (1934) and pals with a co-star of that film, Una Merkel, in Murder in the Private Car later in 1934. The pair also appeared in It's in the Air (1935) starring Jack Benny. 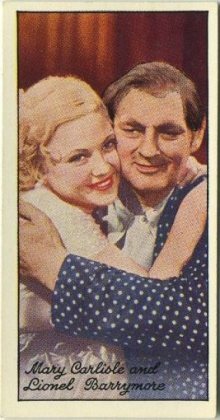 Carlisle is featured in support in 1935's Kind Lady, her only film credit that has been covered in detail on this site HERE. 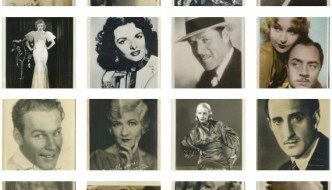 She had pre-WAMPAS bits in Madam Satan (1930) and Grand Hotel (1932) and meatier early parts in titles such as Night Court (1932) starring Walter Huston, Down to Earth (1932) starring Will Rogers and Men Must Fight (1933) with Lewis Stone and Diana Wynyard. 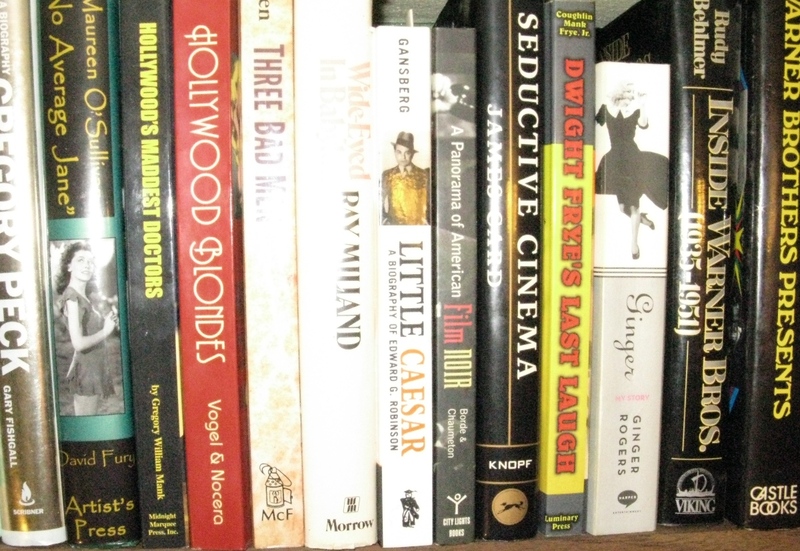 Then came College Humor with Crosby after which the busiest part of her career developed, most immediately into those few better known roles listed above. Mary Carlisle was awarded with a star on the Hollywood Walk of Fame in, according to the official website, 1960. Wikipedia notes the date as 2010, but my immediate assumption that this is an error caused by the date that this Los Angeles Times Star Walk profile was posted. 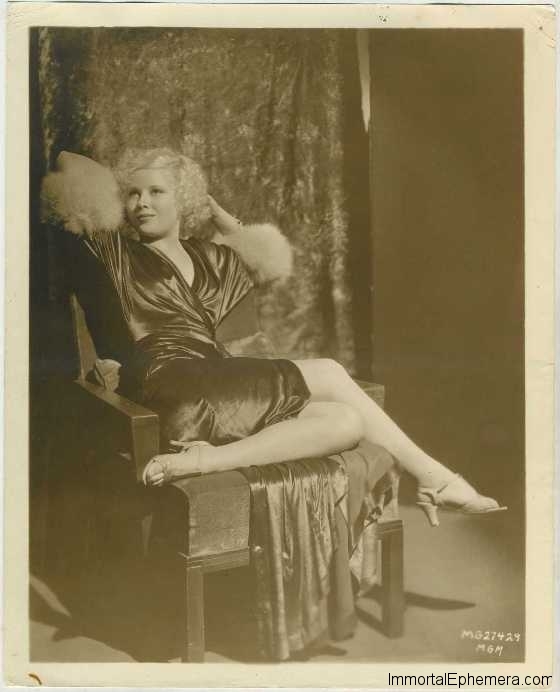 Mary Carlisle was one of those beauties of the 1930s who seemingly left the screen on her own terms for marriage and family. Watching the eye popping movie starlet today she's got enough presence and talent on top of those looks to make you wonder why you don't know her better than you do. While her film credits lack a signature title, she's appeared alongside enough legends to sustain at least some movie immortality. 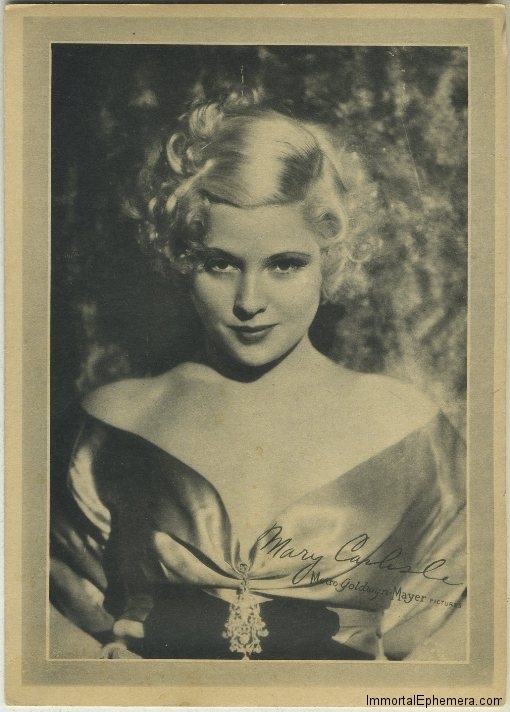 Glamorous Mary Carlisle MGM Promotional Portrait from the early 1930s. 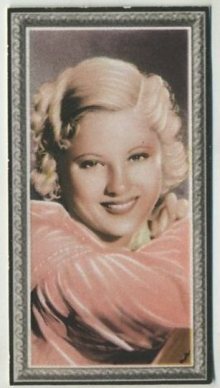 This 1940 Godfrey Phillips tobacco card of Mary Carlisle presents a colorized image of the same photo used in the black & white card from the same issuer shown at the top of this page. 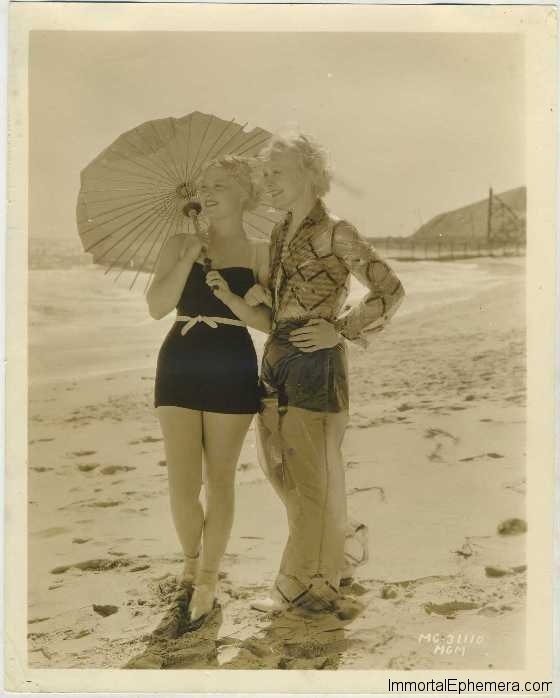 Early 1930s MGM Promotional Photo puts Mary Carlisle on the beach with fellow starlet Ruth Channing. 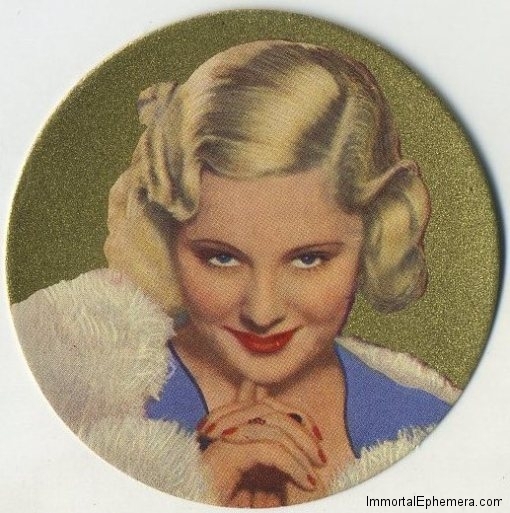 Mary Carlisle tobacco card from a very popular circular set issued by Rothmans in 1939. 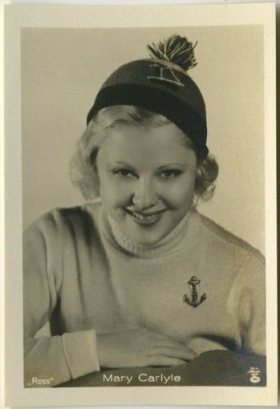 Mary Carlisle with another young MGMer made good, Jean Parker, on an early 1930s Promotional Portrait. 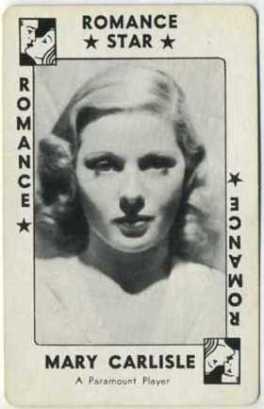 1938 Game Card from Movie Millions set. 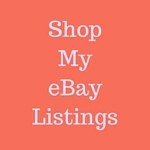 Hi Larry, every so often I see notice from a friend-of-a-friend-of-a-friend (etc.) on Facebook that she’s doing fine, and I too hope that continue to be the case! She really radiated youth in the early ’30s and, I agree, very pretty.